How the presentation of a can of soup tells you a lot. Think back to a time when the world was rebuilding itself after the Second World War. The post-1945 world was a world in shock and Western-Europe was in ruins. About two decades later some parts of the world became very prosperous again, among others Western-Europe. 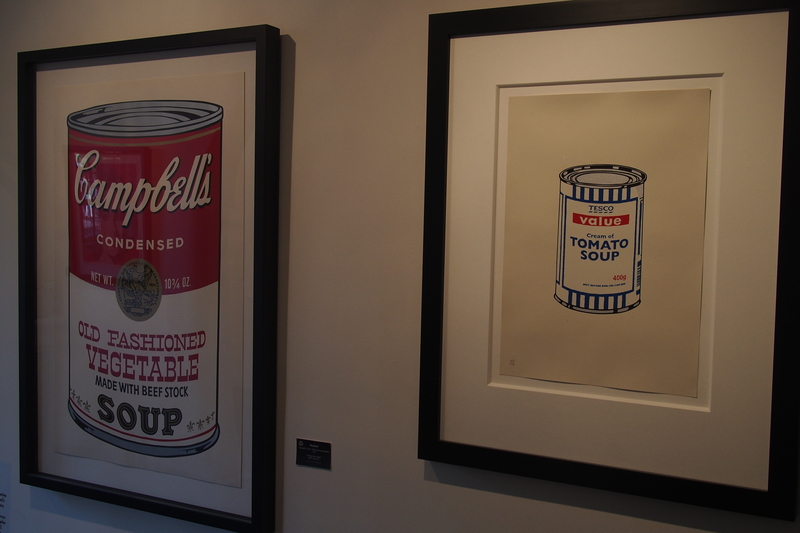 Well that was when Andy Warhol made Pop Art a thing. Pop-Art is in essence a celebration of the modern world where economies of scale enable low-priced goods and all things necessary and pleasant become affordable. 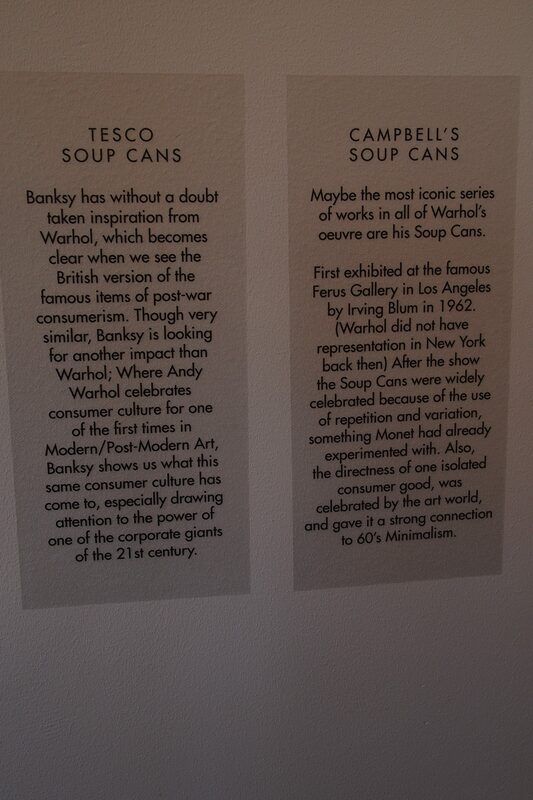 Then apply that to art and Andy Warhol came along and exhibited the “Cambell’s Soup Can.” It was almost a plain advertisement yet he made it art. That was a big leap from art as a craft, tradition and passion that drives people to work hard at achieving their masterpiece. Fast forward to today, the 21st century with all the progress that has been made in technology. Society is overloaded with information, over-saturated markets and the value of goods and services is balancing on the tightrope of the trust of society while the scar of the financial (credit) crisis still has to heal. When I was at the MoCo museum this was a personal highlight for me. Sure you can focus on the street art aspects, graffiti and independent nature of Banksy’s art. But the commentary gives you a context that most people skim over because “why bother?” We should bother because the power of corporations can be scary, too scary. If art is a way of communicating the risk of giving too much power to too few people then this should suffice. However whether the average consumer even “bothers” is a different matter. It is easier to accept the convenience of perfectly marketed product or service than it is to check the specifications and ask questions. From Pop Art about fifty year ago to now we face a world where celebrating what we have is not the best thing to do. The internet is a reality, everybody is on-line, digitalisation and globalisation go hand in hand. Yet the environment and the earth’s climate are affected beyond our imagination. What is of value? Do you value the short-term comfort of your canned soup? Have it your way. Posted in Short Reads and tagged Andy Warhol, art, Banksy, corporation, MoCo Museum, Pop Art, product, service, society, soup can, value on September 8, 2016 by rura88.